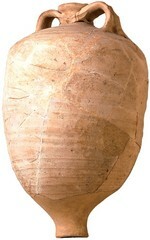 This amphora has a narrow flat ringed base. The maximum diameter of the body (towards the top), is around five times greater that that of the foot. It takes the form of bead rim and the handles have a groove with traces of smoothing to attach them (Laubenheimer, 1985). The form was also copied elsewhere (Laubenheimer & Gisbert Santonia, 2001; Symonds, 2003). From around AD 50 to the end of the third century AD. The majority of the production is localised in the Narbonne region where thirty-six workshops were located, as well as in Languedoc and in Provence (Laubenheimer, 1985; Laubenheimer & Schmitt, forthcoming). Their products are characterised by a calcareous fabric. Imitations are often found in other parts of France with different fabrics and in reduced quantities (Laubenheimer, 2003; Olmer, 1996; Misone et alii, 1998: 155-6), as well as in Spain (Laubenheimer & Gisbert Santonia, 2001; Symonds, 2003). The Narbonnensian production was essentially destined for export. The amphorae are largely distributed along the waterways of the Rhône-Saône-Rhine and Seine, towards the Rhine limes and to Britain (Remesal Rodríguez and Revilla, 1991). In the south, they are largely distributed in the Mediterannean towards Rome and Ostia. Beyond Italy they are also found in Lusitania (Fabião, pers.comm. ), at Athens, in Crete and Cyprus, along the coast of Turkey, at Alexandria in Egypt and along the route from the Nile to the Red Sea. The furthest extreme is in southern India at Arikamedu (Laubenheimer, 2001). The amphorae produced elsewhere in France are considerably less numerous and seems to have only had a very local distribution. Wine for the Narbonnensian version, according to numerous tituli picti which mention different types of wine, including amineum and picatum (Laubenheimer, 2004).